After passing a no squawk annual last Friday at Van Nuys, I closed the deal, signed all required papers, and the plane was ours. But after the plans to have the previous owner fly it to Eugene fell through due to weather last Satuday, plan B was put into action. So this Saturday, I will fly commercial with my CFI-I to LAX, and shuttle over to Pacoima to pick up N8527W and head north. It is no secret that I want to get my Instrument Rating, so I can use the new plane up here in Oregon. So my instructor will fly right seat with me for the trip home, and has planned a full IFR trip with a fuel and grub stop in Redding. His theory is that this will be a great opportunity to teach me in real-world IFR conditions, while also getting to know my new flying machine. I will talk to LA Center, and if I'm doing it right, I'll fly on a tight ribbon of airspace reserved just for me, holding heading and altitude like a 20-year Line Captain. In a couple of days, after blasting two-seven whiskey off Whiteman for the last time, we'll crank it around to the north direct Gorman, punch out and up to ten grand, and then sit back and give that sweet S-Tec 50 a nice flight test. 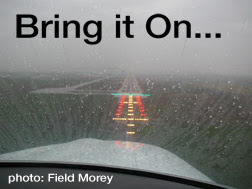 I am very eager to finally – after almost 12 years of VFR flying – be taking it to the next level, quite literally. After I get my IFR ticket, I look forward to filing IFR and tooling up to places like Boeing Field, where I'll dance with Dreamliners as they depart Everett. In a VFR world, getting into a field like that would be a crapshoot, being vectored like second class traffic just so ATC can keep you out of the intakes of a 747 on short final. But on an IFR flight plan, I will have as much right to my little chunk of airspace as the -47, and ATC will have me on the ground in no time. On my delivery flight home this weekend, I hope to get a dose of low clouds and light rain as we depart Los Angeles, proceed on course as filed, and then shoot an ILS approach into RDD for some killer Chinese at the terminal. 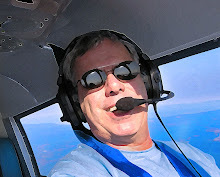 Leg two ought to take us into real IMC north of Medford, and just past Roseburg – where the notorious 4,000 overcast ceiling begins – we ought to be setting the panel up for the ILS 16R approach into EUG. Tick past imaginary places like FRAKK and HOCUM, intercept the localizer and slide down the glide slope to minimums, arriving with a greaser to remember. While some pilots would stay parked when the Willamette Valley stays overcast, Dano Airlines will be flying soon, as long as (a) freezing levels are far higher then any passes, and (b) the thunder and lighting is over in Kansas where it belongs. As I sit here typing this – waiting for 6A on Saturday morning when Alaska launches me southbound direct LAX – the sweeping second hand on the wall clock cannot move fast enough. To finally have a plane of my very own sitting 656 NM away and not be able to see it, touch it, caress it, is pure torture if you are me. But patience will prevail, I will fill the next 34 hours with work and restless sleep, and it'll be parked in my hangar before I know it. It is at that point, when I can open my hangar and gawk at the most beautiful plane in the world, that the rest of my life begins. Halla-freakin-lewya!